Powers/Abilities: Jake Fury was a highly trained combatant in excellent physical condition. He was proficient with various conventional and unconventional weapons, chief among which was the Scorpio Key. (Wolverine & Nick Fury: Scorpio Rising) - The son of Nick Fury and Amber D'Alexis was part of the royal family of the nation of Carpasia in which he was raised. (Marvel Graphic Novel: Wolverine & Nick Fury: The Scorpio Connection (fb) - BTS) - Though the son of Nick Fury, Mikel's mother told him that he was the son of Nick's brother Jake in order to foster hatred for Nick, who had seduced and betrayed her years before; Amber had loved both Fury brothers. Throughout his earlier life, Amber conditioned him to hate Nick Fury so that he would be consumed to slay him. (Marvel Graphic Novel: Wolverine & Nick Fury: The Scorpio Connection (fb) - BTS) - When Mikel became an adult, Amber allied herself and Mikel with the terrorist organization Swift Sword, who helped fund and develop the Scorpio Key. Working for Swift Sword as the terrorist Scorpio, he used the Key to take out strategic SHIELD outposts. (Marvel Graphic Novel: Wolverine & Nick Fury: The Scorpio Connection (fb) - BTS) - Scorpio took out a SHIELD outpost in Taiwan. (Marvel Graphic Novel: Wolverine & Nick Fury: The Scorpio Connection (fb) - BTS) - Scorpio took out a SHIELD outpost in the Balkans. (Marvel Graphic Novel: Wolverine & Nick Fury: The Scorpio Connection) - Scorpio took out the SHIELD outpost in Machu Picchu, Austrialia, killing everyone present, including David Nanjiwarra, who had been a double agent for Swift Sword. Later, after relaxing on the pleasure port island Andros, Mikel joined his mother, demonstrating his skill with the Key and expressing his frustration about not being able to go after Nick Fury himself. Amber assured him that they had to first tear apart SHIELD, the organization for which he cared so much, and only then could they tear apart the man himself. (Marvel Graphic Novel: Wolverine & Nick Fury: The Scorpio Connection - BTS) - Scorpio took out a SHIELD outpost in Peru. (Marvel Graphic Novel: Wolverine & Nick Fury: The Scorpio Connection) - Scorpio assaulted a SHIELD outpost in Venice, Italy, where he was confronted by Nick Fury, who had anticipated his assault. Scorpio fought back, but eventually escaped after the Scorpio Key was rendered temporarily nonfunctional by a dunking in the canals. Wolverine, drawn into the conflict by the death of his old friend David Nanjiwarra, tracked Scorpio to Istanbul, but was incapacitated by the Scorpio Key. However, Fury had tracked Scorpio there as well and rescued Wolverine. The two heroes then tracked down Scorpio's base, but Scorpio and Amber had already abandoned it and set a trap intended to contain them for the duration. Meanwhile, Scorpio assaulted SHIELD's central information base in Atlanta, Georgia, only to be confronted by the heroes who had overcome and escaped the trap. While Wolverine and Scorpio fought to kill each other, Amber told Fury that Scorpio was really his son. Though shocked initially, Fury regained his composure and shot Scorpio in the shoulder. Amber then grabbed the Scorpio Key and attacked the pair, more than willing to sacrifice her son to achieve her goal of killing Fury, as Mikel had never been anything beyond a means to an end for her. As she prepared to slay Fury, however, Wolverine skewered her through the chest, killing her. Scorpio tried to flee, but the two stopped him, and Scorpio surrendered. Nick planned to try to help Mikel recover from a lifetime of brainwashing. (Wolverine & Nick Fury: Scorpio Rising) - Nick Fury continued his "tough love" training of Mikel, not pulling any punches during combat training on an artificial SHIELD island. After being knocked to the ground, Mikel complained that it was pointless to play games while his countrymen of Carpasia were slaughtering each other. Despite Nick forbidding his doing so, Mikel stole the Scorpio (or Cosmic) Key from its containment chamber, beating the guard who tried to stop him, and made his way to Carpasia to put down the insurrection which was being backed by Hydra. In Carpasia he was confronted by both Nick Fury and Wolverine, but a pair of beautiful Hydra agents came to his aid, holding the two heroes off with automatic weapons while the women escaped with Scorpio. Seeking the Scorpio Key for themselves, the two women then tried to seduce Scorpio, and then an Amber D'Alexis Life Model Decoy (LMD) attempted to convince him to hand over the Key. Nick Fury and Wolverine then burst in, exposed the farce, and helped Scorpio escape. However, the Hydra agents had placed a bug on Scorpio and learned where he had hidden the Key. Wolverine, Nick, and Scorpio arrived just after Hydra retrieved the Key, but they nonetheless overpowered the criminals and retook the Key. They then forced an agent to reveal where Hydra was developing LMDs to back their insurrection, and Wolverine destroyed the entire base with the Key. After capturing the ringleaders of the rebellion, Mikel was placed as acting president of Carpasia, promising to let freedom ring for all. (Fury of SHIELD#1 (fb)) - Mikel found that dragging a bankrupt dictatorship to democracy was an uphill battle, and he found himself battling against his Ministers of State, Defense, and Trade, whom he discovered were running a thriving business in black market Snickers™ bars. Using the Scorpio Key to destroy their holdings, he tendered his resignation and returned to the USA. (Fury of SHIELD#1) - Mikel met with Nick Fury, who agreed to reinstate him as a SHIELD, despite opposition from other members. Scorpio (sans Key) and Nick Fury worked together in investigating the activities of Hydra's Karl Kraus, battling agents looting Polydyne. (Fury of SHIELD#3) - Having learned that Drake was actually Kraus' first wife, Melanie, who sought vengeance for her mistreatment and planned to blow up Manhattan, Mikel joined Nick, Lockhart, and Iron Man in opposing Drake. Drake and Kraus ended up killing each other, and Nick then decided to show Mikel his old neighborhood. (Fury of SHIELD#4) - Nick took Mikel through Hell's Kitchen, which they found to be full of crime and corruption, and they found that renegade government agent Nathan Spanier, allied with Russian mercenary Firefox, was supplying some criminal gangs with high-tech weaponry. Despite Mikel's using the Scorpio Key, both he and Nick were captured, though one of the gangsters accidentally activated the Key, shattering their prison, and the two defeated Spanier, Firefox, and their agents. By this point, Nick and Mikel had finally established a friendly relationship. (Fury/Agent 13#1-2 (fb) - BTS) - Nick Fury was trapped within a pocket dimension and was replaced by a special LMD duplicate able to fool even Wolverine's enhanced senses. (Double Edge: Alpha - BTS) - While Doc Samson attempted to treat the Punisher (Frank Castle)'s psychoses via experimental regression therapy, the effort was sabotaged by rogue government agent the Spook, causing Castle to believe that Nick Fury was the one who had killed his family. (Daredevil I#344) - The Punisher ambushed and savagely beat Mikel, taking him hostage to draw in Nick Fury. They initially thought Mikel was dead, but the Punisher had used "mercy bullets," wishing only to make Fury feel the pain of losing a family member. The Punisher escaped after a short skirmish, and Daredevil detected that Mikel was still alive, though he had been overdosed on the Punisher's drugs and was saved just in the nick of time. (Ghost Rider III#65) - Having recovered, Mikel argued with the Nick LMD, trying and failing to convince him to lay low until the Punisher had been captured. (Double Edge: Omega) - Mikel blamed Doc Samson for the Punisher situation; he argued for killing the Punisher, and continued to futilely try to convince the Nick LMD to avoid the Punisher. Mikel later donned an eyepatch and posed as Nick Fury to draw out the Punisher, convincing "Dum Dum" Dugan to go along with his charade. The Punisher, however, quickly saw through the farce, assaulting Mikel, Dugan, and Doc Samson with a rocket launcher; Mikel and Dugan suffered minor injuries, though Mikel did begin wearing an eyepatch. When Nick Fury went after the Punisher himself, Mikel ordered SHIELD troops to follow him, but they arrived too late. All believed Nick Fury had been slain, and the Punisher was arrested. (Incredible Hulk II#434 - BTS) - Mikel presumably attended the funeral for Nick Fury. (Punisher III#1) - Mikel was present when Castle was sent to the electric chair for killing Nick Fury--and allegedly an innocent family in Central Park (actually killed by Bullseye). Unbeknownst to Mikel, the electrocution had been rigged by the Geraci crime family, and he was only stunned, though he was pronounced dead by a medical examiner paid off by the Geracis. (Punisher III#7) - Upon learning that Castle had survived--ignoring evidence that Castle had been framed for the Central Park killings and disobeying orders to the contrary from temporary acting head of SHIELD Val de la Fontaine--Mikel led a squad of SHIELD agents to ambush the Geraci mansion. Things quickly degenerated into a shootout between the Punisher and his Geraci allies and Mikel and his rogue agents. Ultimately, newly appointed head of SHIELD G.W. Bridge arrived and put a halt to the attacks, and he also exposed Mikel's plot: using a force field for his own protection and "mercy bullets" to fake the slaughter of the Geracis, Mikel had intended to goad Castle into firing on him, then have the SHIELD agents switch to live ammunition to kill the Punisher. Mikel was subdued and then expelled from SHIELD. (Iron Fist III#1 (fb) - BTS / Punisher III#7) - The Key was placed into S.H.I.E.L.D. custody after Mikel Fury was expelled from the organization (see comments). (Secret Warriors#1) - Mikel was listed on SHIELD's agent files as a member of the Carpassian Seperatist Movement. (Secret Warriors#24 (fb) ) - Nick Fury visited Mikel in Moldova and asked him to become leader of a caterpillar team. Mikel gladly agreed to work for his father. The following weeks Mikel put together Team Gray. (Secret Warriors#11 (fb) - BTS) - Nick Fury made Mikel the leader of Team Gray. (Secret Warriors#11) - Mikel attended a meeting at Fury'S Hotspot base in France with Alexander Pierce and Quake, the other leaders of caterpillar teams, Olivia Hooks, Dugan and Nick Fury. (Secret Warriors#12) - Fury told Mikel, Pierce and Daisy to tell the others in the room what they were currently up to. Mikel told the others that he and his team were dealing with the Leviathan problem and that they found nothing on them until one month ago when Fury discovered Leviathan double agent Seth Waters working at the Department of Treasury. Fury then told Mikel, Daisy and Pierce about the Russian espionage organization Leviathan and how dangerous they were. (Secret Warriors#16) - Nick Fury contacted his caterpillar team leaders, including Mikel, via holographic interface from the Pieta base to inform them that Leviathan's leader Orion had been revived and that Leviathan was fighting Hydra, which suited Fury's plans. Fury told Mikel and the others to get their teams ready and sent them further orders after the meeting. (Secret Warriors#24 (fb) ) - Nick Fury sent Mikel and Team Gray to Hydra's Hive base. Mikel and his team were overrun by parasite-controlled Hydra agents. Mikel blew up the base and sacrificed himself and Carlos Ayala, the last survivors of Team Gray in the process. (Secret Warriors#24) - Nick visited the graves of Mikel and Team Gray. Comments: Created by Archie Goodwin & Howard Chaykin. Even out of costume, pretty much everyone called him Scorpio, though I've only used it--for the most part--when he was in costume. Scorpio was pretty cool in the Scorpio Connection, but it was all downhill from there. Nowadays he doesn't get mentioned too often. Zodiac Key or Scorpio Key (or Cosmic Key)? ...or, what a frickin' mess!!! Despite an erroneous footnote in Defenders I#49, the histories and chronologies are clear for the Zodiac Key up to West Coast Avengers II#28 and for the Scorpio Key up to Fury of SHIELD#4. The problems start in Iron Fist III#2, which states that the Zodiac Key from the Ankh dimension is the same as the Scorpio Key used by Mikel Fury, and IF III#2 is supposed to be its appearance following Mikel's banishment from S.H.I.E.L.D. in Punisher III#7. At the start of Iron Fist III, SHIELD has the Key, which is sought for its solar power by one of the H'ylthri to provide a photosynthesis web to restore his people to life. In the end, SHIELD reclaims the Key. It is referred to as the Scorpio Key most often in this story. In Elektra II#1-5, the Scorpio Key (as it is consistently referred to) falls into the hands of Iraqi dictator Saddam Abed Dasam, who describes it as being referenced in the scriptures. Dasam intends to use it for unclear purposes, and in the end, Elektra takes the Key and gives it to her father's killer, to keep it hidden from others. In Avengers III#57-60, a new Scorpio, identified only as part of a mysterious boardroom Zodiac, uses a slightly differently appearing Zodiac Key from the Dimension of Ankh. Dr. Doom says that the earlier Zodiac Key "decayed into dust while under watch at SHIELD several weeks ago). The Zodiac Key, made of solid mineral from the Dimension of Ankh, and the Scorpio Key (a.k.a. 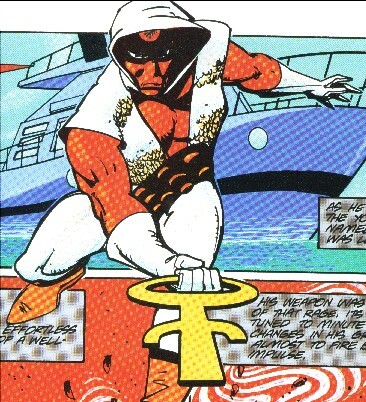 Cosmic Key), an electronic weapon designed with the aid of the terrestrial Swift Sword organization, are two separate Keys, as was always the case, right up to Iron Fist III#2. The Key in Iron Fist III#1-3 could really be either. The fact that it was in SHIELD custody would be consistent with SHIELD holding Mikel Fury's Scorpio Key after his expulsion, which is consistent with the story. The Zodiac Key was sent back to Earth from the Ankh Dimension, and could easily have ended up back in SHIELD custody. The fact that it was sought by the alien H'ylthri and had solar power might seem more consistent with the Zodiac Key, but it really could be either. Sharyd (Conal) refers to the Key as the "Key to Heaven," which also seems more mystical than mechanical. Nothing about solid mineral or having circuitry is mentioned, and its actually possible that neither the H'ylthri or anyone else in the story (including the writer) understood that there were two keys, or if they did, they may not have known which was which. The Key in Elektra II#1-5 could really be either. The fact that it was referenced in scriptures would seem more consistent with an ancient history, such as with the Zodiac Key. The way it found its way into a situation of strife is consistent with the Zodiac Key, but it could just as easily have been stolen from SHIELD, which is how they knew he had it. It is consistently called the Scorpio Key in the story. Again, this could be a mistake on the writer's part, or on the characters'. They Key referenced in Avengers III#59 would almost have to be the Zodiac Key, as it specifically references the Ankh Dimension (though Doom names it the 13th dimension). The fact that it disintegrated under SHIELD care would seem consistent with it being the same Key from Iron Fist III#1-3, though it could be that SHIELD somehow reclaimed the Key from Hugo Natchios' killer. Based on the above information, I have written the relevant profiles as if it were the Zodiac Key in Iron Fist III#1-3, primarily b/c it ended up back in SHIELD care, which is where the Zodiac Key was when it disintegrated. I've gone with the one from Elektra being the Scorpio Key, which presumably still exists and remains in that mans' care. Re: Iron Fist III#1: The H'ylrthi have more of a claim on actual mysticism than Saddam not-Hussein, and the overall power level of the Key in IF III seems more in line with the Zodiac Key, not the Scorpio Key. Re: Elektra II#1-5: Fulfilling prophecies do not necessarily mean mysticism or age -- one might argue that the Weathermen fulfilled Nostradamus's prophecies in Avengers I#210, despite their powers being synthetic and created specifically to mirror the prophecy. be yours," that doesn't exclude the SK. Plus I'd expect that the Key's sentience and more exotic powers would have been in evidence at some point if Saddam had a genuinely prophesied relationship to it as suggested. Surely that'd mean he was a "chosen" wielder, with all of the Jake Fury privileges, right? I'd go with the Iron Fist Key being the Zodiac Key misnamed due to its association with Scorpio, and the Elektra Key being the artificial version. Perhaps SHIELD deliberately misnamed the Zodiac Key to lessen the odds that someone like Death-Sting or Saddam would steal the correct one? The difference between a powerful energy weapon and an extradimensional cosmic weapon is significant, after all. Iron Fist III#2 is a ret-con which reveals that there only ever was one Key. We've never seen both in the same place, and despite Mikel's belief that his Key contained circuitry, it might have been the solid Zodiac. Perhaps Swift Sword, involved in conflict and strife, attained the Key and tried to play it off as their own invention. I don't like this option as much, but it the only one which would make all stories potentially true. By making them two Keys, we have to accept an error in Iron Fist III#2. At any rate, if there was only one Key, then that Key disintegrated, meaning that the only currently existing Key is the new Zodiac Key fashioned by the boardroom/World Trust Zodiac in the Ankh Dimension. Nah, it's just a mistake by a writer who was then relatively new to Marvel. synthetic nature is actually something of a plot point in that sequence. That was my point, he says he can't use it in the canal, because the muck would screw the circuitry, but I'm not convinced that he actually tried it. He seemed to just feel that way. stuff, being from a kung-fu Briggadoon and all that. Actually, yes, Malik Shippinsky calls it the Scorpio Key...it is he that describes it as being the same as the Zodiac Key. OK, but where does the name Cosmic Key come from? Scorpio Connection = Scorpio Key, no questions asked, in my opinion. Scorpio Rising: In the prologue, they refer to Mikel's weapon from SC as being designed after the Zodiac (or Cosmic) Key. They also call it an imitation Cosmic Key. In the story itself, they call it the Cosmic Key once (SHIELD kept Scorpio's Cosmic Key...for safekeeping), and just call it the Key the rest of the time. There is no indication that this is not his original Key. It DOES have three prongs, though the two outer ones are squared off, rather than curved as shown in this profile. In Fury of SHIELD#1, it is called the Cosmic Key, but has three prongs. Only in Fury of SHIELD#4 does it have a single prong; it's called Cosmic Key for the last time, there, which is the last time Mikel wields it. The Iron Fist series Key has three prongs and it called the Scorpio Key throughout the story, though the error is quickly explained when they refer to the two Keys as being the same thing, meaning the writer and/or the characters don't know the difference. As explained above, I believe this to be the Zodiac Key. The Elektra series Key is identified as the Scorpio Key and it has three prongs. Mikel Fury had TWO Keys. One, the Scorpio Key, was apparently an electronic copy of the original. Later, in SCORPIO RISING and the FURY mini, he used a different key, which he called the Cosmic Key. I'm told SHIELD built this version. It's likely that the Swift Sword key remained in SHIELD custody all the while (Whether it's the real one or not is an open question. Your interpretation is as good as any). I have a theory that Mikel may have taken the Cosmic Key with him, and used it to become the Ecliptic-Scorpio. That Scorpio's Key also had a single prong (like the Key seen in Fury of SHIELD#4) (plus a crossbar) and he did call himself "a former hero". It's a bit of a stretch, perhaps, but I can't think of anything in particular in those AF stories that rules it out. I can't really see anything to rule this out, but IF...IF there were two Keys, than I'd say the new Key showed up in Fury of SHIELD#4. Unwilling to let him use the dangerously powerful Scorpio Key in action, they instead manufactured one for him...maybe, but I thought it was just artistic license (not an error, of course!). The Zodiac Key (occasionally incorrectly called the Scorpio key) is the creation of the Brotherhood of the Ankh. Everything we know about it up to it's return to the Ankh Dimension is accurate. Nothing needs changing. The Scorpio Key is the artificial creation of Swift Sword, with circuits and solar power, and the EXACT same shape as the original. This was not merely a design choice (see below). 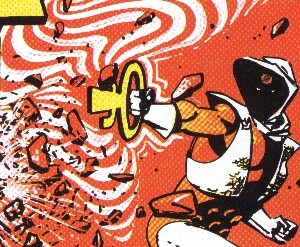 The Cosmic Key is the SHIELD creation, which notably has a different design and much less power. So my theory goes like this. When the Swift Sword developed the Scorpio Key, they created (accidentally or by design) an "antenna" tuning into the 13th (or Ankh) Dimension. The Brotherhood allowed this, empowering the Key, because it fed them the same energies of conflict as the "true" Key. the much less powerful Cosmic Key), but eventually decided to leave it in reserve. Meanwhile, Mikel eventually stopped using the Cosmic Key in action. When he was expelled from SHIELD, he either took it with him, or it was destroyed. This part is less supported by facts. Mikel improved/rebuilt the Cosmic Key, and wandered a bit, until he met Ecliptic. He became Scorpio again, clashed with Alpha Flight, and met his end at the hands of Weapon X. Around the same time, however, the Scorpio Key was stolen (as part of the Iron Fist story), and began feeding the Brotherhood energy again. Technically, it was identical to the Zodiac Key at that point (and probably shared certain of it's energy signatures), although it was not the same artifact. When it ended up back in SHIELD custody, the Brotherhood finally decided it would never be of use again, and burned it out, causing it to disintegrate. Then they gave a Zodiac Key to the new Scorpio, and turned him loose. And he's still around. The chronology is a little off, as the Elektra story is more recent than the Iron Fist, but that shouldn't really change anything too much. Still, making more and more Keys is just more complex, and its clear that no one can keep track of just two Keys, so why make 3-4? Mario's alternate theory involves the Cosmic Key and Scorpio Key being the same, but Mikel recreating a new Key as part of Ecliptic's Scorpio. Having the Elektra story take place after the Fist mini also isn't a problem. One could say that after trying the "random drop" theory with not-Saddam, and having it also fail, they decided instead to create a new Scorpio, one who was more in tune with their goals, and less likely to leave it in a lab or closet. So they burned out the Scorpio Key (Mikel's) in SHIELD custody, withdrew the Zodiac Key they sent to not-Saddam, and started from scratch. The Zodiac Key has an entry in the All-New OHotMU Upate#3. Scorpio, leader of the Zodiac-Ecliptic, @ Alpha Flight II#1, but see the comments, because they COULD be the same guy. The unnamed Key of Ecliptic's Zodiac's Scorpio's Key, @ Alpha Flight II#1, but see the comments, because they COULD be the same guy. KEY (	) - Australian mutant, brother of Wall, formerly worked in Randall shire's traveling circus, later forced to serve him after he was possessed by one of the Undying, secretly opposed him although couldn't disobey direct orders, assisted Cable in defeating undying, reprogrammed Azazel to transfer their consciousnesses in cockroaches. other "Key" characters, items, etc. An electronic weapon funded by and designed with the aid of the Swift Sword terrorist agency, it was wielded by Mikel Fury (Scorpio) in a number of strikes against SHIELD. Amber D'Alexis used it after Scorpio's defeat until she was slain. It was then taken into SHIELD custody, but Scorpio--training as a SHIELD agent--stole it to help free Carpasia from a hostile takeover by the Hydra backed Baltazar Pavel. Mikel Fury became president of Carpasia, but he took left and took the Key with him after discovering his cabinet's corruption, destroying a black market operation with it as a parting gift. Once rejoining SHIELD, he rarely used the Key, though he did bring it to Hell's Kitchen when he and Nick investigated gang using high-tech weapons. The Key briefly fell into the hands of corrupt US government agent Nathan Spanier, who accidentally used it to free Nick and Mikel, who reclaimed the Key as they defeated Spanier and his allies. The Key was placed in SHIELD custody following Mikel's expulsion. The Scorpio Key somehow came into possession of Iraqi leader Saddam Abed Dasam, who was being backed by Hydra. SHIELD hired Elektra to kill Dasam and recover the Key for them, but Hydra then offered to pay her double to complete the assassination of Dasam--whom they had come to believer was severely limited in his goals, but to give the Key to them. Elektra refused this second offer, defeating Hydra's agent, the Silver Samurai, but Dasam then double-crossed his allies and activated the Key on its own, unleashing its power and disrupting all energy flowing around his fortress. Elektra invaded Dasam's fortress, finding Dasam himself in a trance, holding the activated Key, with his supporters laying on the ground, with only skeletons remaining. Elektra attacked and killed Dasam, deactivated the Key and escaped with it. Refusing to give it to Key to SHIELD, Elektra instead gave it to the former policeman who had accidentally killed her father years before. Knowing that she and the man shared an intimate bond of tragedy and could therefore trust him, she left the Key in his possession. The Scorpio Key was able to channel unspecified energies for a number of effects, including disintegration of a person or even of a much larger area, disruption of power over a wide area, etc.. It allegedly contained delicate circuitry that was unable to effectively function when wet.